Las Vegas is a city that never stops giving. It always has something new to offer everyday – like Dive in Movies at Boulevard Pool. 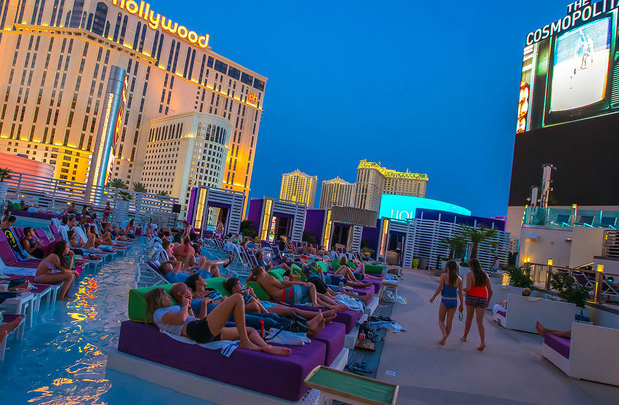 Every Monday night until September 5th is Dive in Movie Night at The Boulevard Pool at Cosmopolitan of Las Vegas. The marquee, located poolside, transforms into a gigantic movie screen and displays blockbuster and classic films. True to its name, Dive In Movies lets you take a dip in the pool or relax on a poolside daybed while enjoying the movie of the night. And because you are in Vegas, regular movie concessions are out. You’ll get treated to upscale handcrafted drinks and exclusive, rotating menu specially created by the team of Scott Conant of D.O.C.G. ENOTECA. Food choices include truffle popcorn, gourmet hamburger, and special margherita pizza. Doors to the Dive in Movies open at 7pm and the movie begins half an hour after. Tickets are sold for $5. After the movie, take the opportunity to see the sights of Vegas onboard a shiny limousine from Earth Limos & Buses. You can even stop at The Welcome to Las Vegas Sign, High Roller at the LINQ, Fountains of Bellagio, and other attractions for a photo. Call up Earth Limos & Buses at 725-777-3333 or visit them at www.earthlimos.com to learn more about their tour and transportation packages. Filed Under: What's HOT in Vegas?